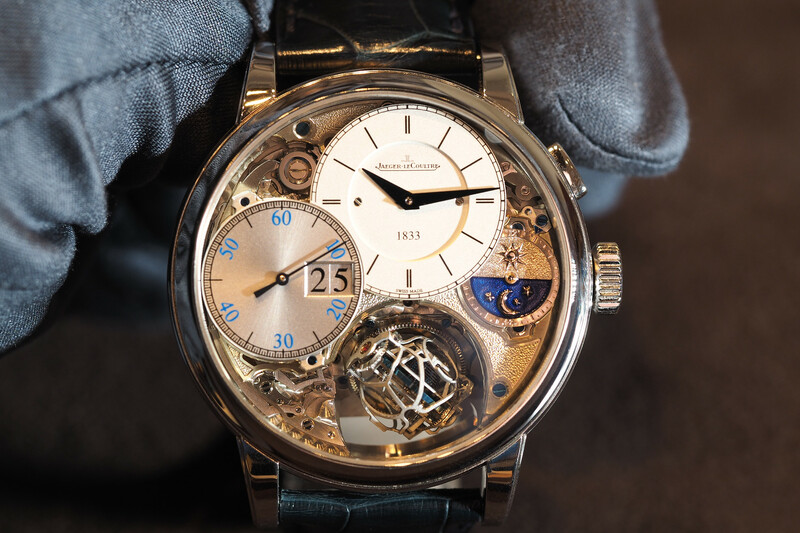 All Duomètre timepieces feature a dual-wing system which has two distinct mechanisms. In this case, the first is dedicated to displaying the local time, and the second to showing a second time zone. 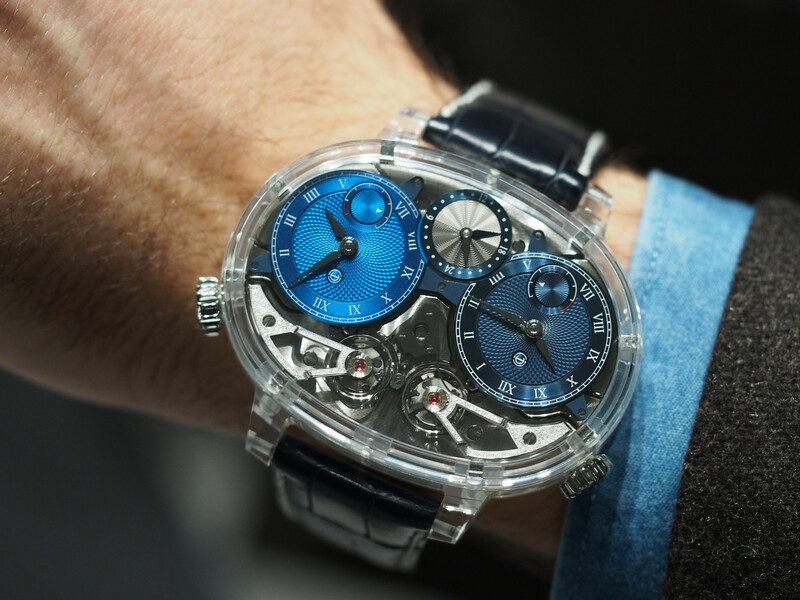 The mechanisms share the regulating organ but they have independent power sources which prevents energy loss due to interaction between the two mechanisms, thereby enhancing the watches accuracy. To wind the timekeeping barrel, the crown needs to rotated counter-clockwise, and the travel time zone barrel needs to wound clockwise. 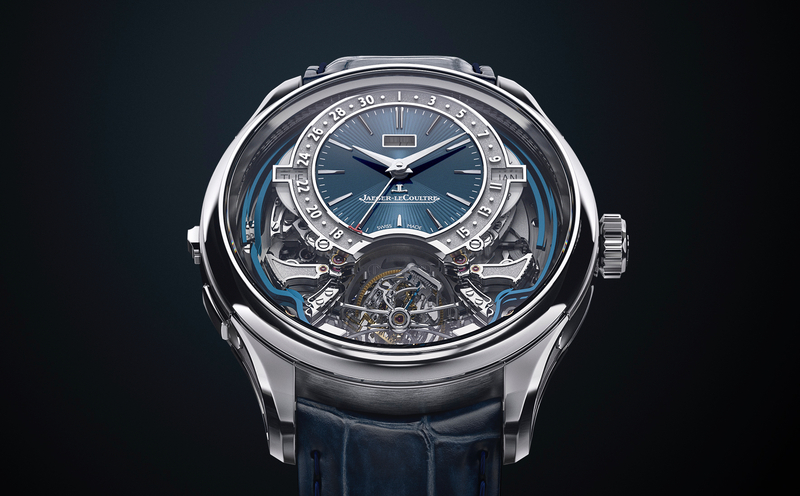 The Jaeger-LeCoultre caliber 383 runs at 4Hz, has 498 parts (54 of which are jewels). The (home time) function has hours and minutes, and the (travel time) displays hours (jumping digital 2nd time zone display), minutes and world map indication. The dial has a silver-toned grainy finish. On the left (at 10 o’clock) a 2nd time zone is displayed with jumping digital hours and a blue minute hand. 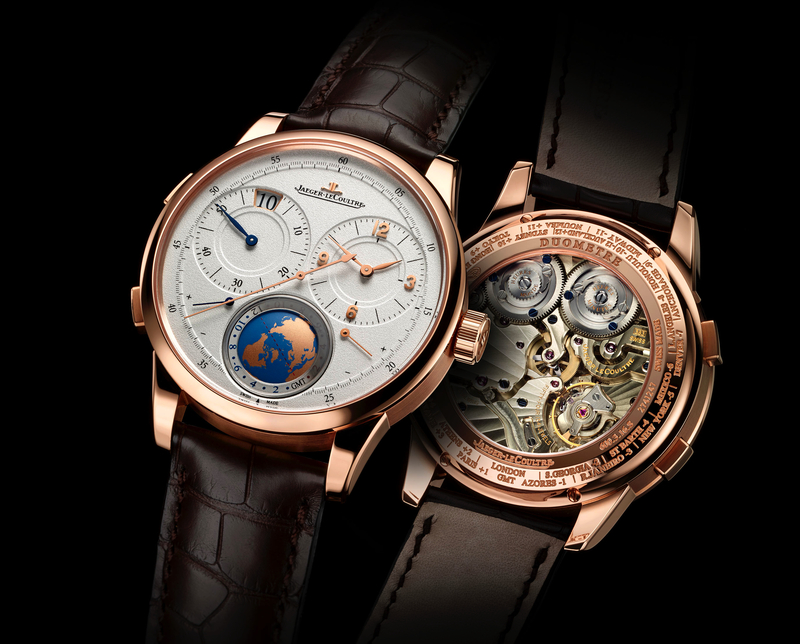 On the right (at 2 o’clock) is the home time zone, displayed by gold, traditional hour and minute hands. Below each time zone display, are power reserve indicators for each respective mechanism. At 6 o’clock is the world map time zone indicator. A central seconds displays seconds for both time zones. The pink gold case measures 42 mm x 13.65 mm, and has polished lugs and satin brushed case band. Brown alligator leather strap with pink gold pin buckle. Water-resistance 50 meters.